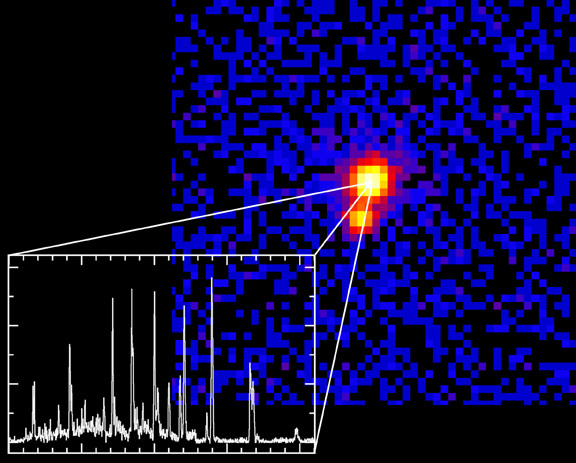 This figure is a composite of the X-ray spectrum and CCD image of Zeta Orionis. The Advanced CCD Imaging Spectrometer (ACIS) image (upper right) clearly shows that Zeta Orionis is a binary, or, double, star system. The recent results by Waldron and Cassinelli focused on the larger "A" component of the system. The spatial resolution between the "A" and "B" elements of Zeta Orionis are a mere 2.4 arcseconds away from one another, demonstrating the fantastic resolution capable by the Chandra X-ray Observatory. The color contours in the image are scaled logarithmically in relationship to their X-ray intensities. 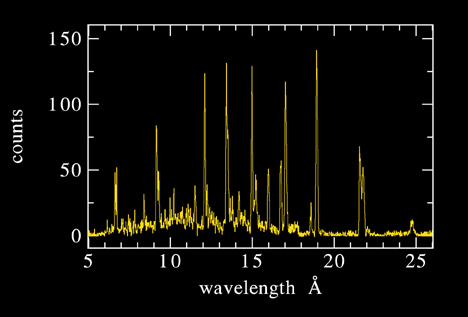 The X-ray emission line spectrum (lower left) represents the Chandra High-Energy Transmission Grating Medium Energy Grating observation of Zeta Orionis "A". By determining the wavelength associated with each emission line, scientists can identify the atomic species and their states of ionization, which can be used to determine the temperature range of the plasma. Furthermore, by measuring the relative line strengths of certain ions, scientists can extract densities and specific temperatures of the X-ray emitting plasma. One major difference between this O-star spectrum and that of other stars such as the Sun is that the X-ray emission lines are significantly broader, indicating a larger dispersion in plasma velocities. Scale Image is 27 arcsec across. Coordinates (J2000) RA 05h 40m 45.50s | Dec -01° 56' 34"